Today Holy Mother Church remembers Blessed Mary of the Incarnation. Though she, Barbara Acarie, had oftentimes felt a call to the religious life, she discerned into marriage for the first chapter of her adult life, largely because she felt so completely unworthy to be a bride of Christ. And so she served God through marriage and had six children, three of whom became nuns and one of whom became a priest. 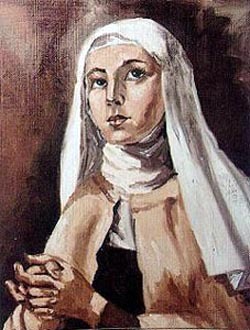 While some may call her over scrupulous (she was quite a woman, and did an incredible amount of good for the Church, yet categorized herself as a terrible sinner), I think it good to see an example of a person who realized (1) what the faith demanded of her, and (2) how much she fell short. The fact that she made these two realizations is what makes her a pretty good example, in my opinion. We all fall short, and most, I dare say, more than Mary of the Incarnation. Mary of the Incarnation: Pray for us!